At the center of this imaginative, skillful novel is the late William "Bill" Dupree: Louisville Republican, husband, father, Episcopalian and devoted enthusiast of old-time railroads. In fact one of the judge's favorite recreational activities is listening to recordings of the powerful steam locomotives of his youth. Appointed by Richard Nixon to the Federal District Court, Judge Dupree consistently rules against the conservative social agenda, especially in abortion rights cases. His opinions disappoint his Republican friends (they always forgive him) and enrage Mary Louise, his fuss-budget wife (she forgives but never forgets). Kindly, respected, and genuinely compassionate, the judge spends a lifetime following his own faith and addressing his frequent doubts concerning the nature of God and man. Of course, his profession demands that he weigh the standards set forth in the law, as well as how those standards shape the fate of living men and women. The life of Judge Dupree (he dies at 82) is an affirmation that law must include not only justice, but mercy and logic as well. William Dupree's legal career is less important to Judge than Dwight Allen's poignant and tough-minded examination of the nature of love and longing. Judge Dupree accepts the notion that love derives from intensity, risk, exhilaration, pain and the defeat that comes from longing. If love is our most confused emotional and psychic condition, then longing is our first, last and most powerful emotion. Allen underscores the novel's emphasis on love and longing in a prefacing quotation from Walker Percy's Love in the Ruins, which suggests that the yearning towards others is central to consciousness. Like any good novelist though, Mr. Allen dramatizes his ideas. Bad novelists, from Ayn Rand to Pat Conroy, are too taken with their own beliefs to bother with characters, plot, setting, or any of those other pesky elements necessary to good fiction. For while William Dupree is central to Judge, Allen succeeds admirably in creating other characters moving through a social world that's often as sad and comically confused as our own. Allen evokes a variety of settings, ranging from upper class suburbs to empty boxcars, that are always on target; and his ear for contemporary American speech is acute. 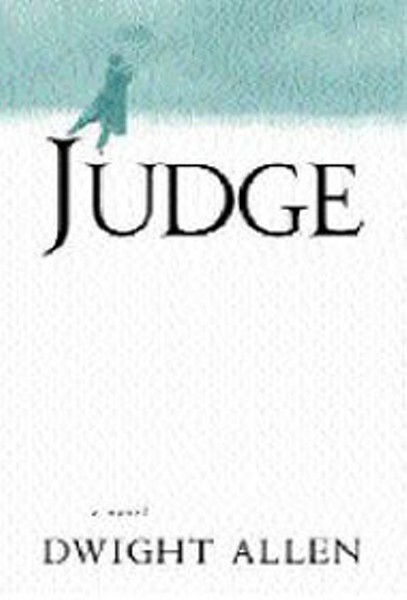 Judge may be Allen's first novel, but it was created by a seasoned writer. Bill Dupree loves Mary Louise (after his death, she suddenly recalls that he called her sweetheart and darling throughout their long, shared life). The judge, however, also loves Lucy, his law clerk of half his age. He understands both his devotion to Mary Louise and his yearning for Lucy: we cannot dictate our love. On the other hand, the judge accepts the necessity of controlling his love for his clerk. Despite his sense of honor, the judge's desire takes physical form. The scene, recalled by Lucy after Dupree's death, is both touching and comic. At the age of 80, the judge kisses Lucy for the first time. Furthermore, she instantly appreciates his passion, and, like a true lover, momentarily forgets age, professional relationships, and the question of adultery. But Bill and Lucy are also perfectly content with hugs and kisses; genuine affection doesn't require sexual triumph, a good thing to know at age 80. Judge Dupree and Lucy overcome self-consciousness, the strongest impediment to love, and most other meaningful human experience. Dupree's self-control -- he yearns after Lucy for years -- is integral to his ability to love, and is an important element in his character. What is at once comic and admirable is Dupree's acceptance of love, in all its forms, as a part of life. His love for Morgan and Crawford, his rootless, drifting sons, and their equally unhappy wives and children never wavers. The judge accepts his cousin Louis, a gay, failed artist, and hopes that Louis will, in turn, accept him. Allen shows us that the judge's capacity for love is rooted as much in his religious faith and his sense of honor as it is in longing. Bill Dupree is a gentlemen, and is, therefore obsolete. He is dignified, as opposed to being arrogant. He accepts others because to do otherwise is a betrayal of his faith and his code. Like all of us, the judge often labors under a faulty sense of perception, a source of many of the novel's best comic moments. Ultimately, though, his style, his manner of conducting life, is out-of-date -- which is a condition all of us should aspire to. Instead of being trendy and fashionable (he's so spiritually healthy, he's actually unaware of trends or fashions), he has a sense of proportion. He faces existence with a sense of both playfulness and seriousness. In short, William Dupree is civilized, and that, above all, makes him obsolete for our times, for this world.